I liked Mark McLay and the Dustdevils' latest album, Love and Barbwire, immediately. For one, I've always thought "peace and love" was a bunch of horseshit—love and barbed wire being much more realistic. Two, the album opens with the cheerfully pessimistic, oddly upbeat song "25 Miles of Barbwire," a fitting soundtrack addition for a decent postapocalyptic sci-fi movie with a sense of humor. It's a postapocalypse of the world, or a once-promising but now imploded relationship. Equal parts Americana, roots and straightforward pop-rock, McLay alternates mournful ballads with clever songs on the lighter side. "Standin' in the Fire" is a standout track, with its minimal lyrics remaining open-ended enough to evoke both the inferno of bad love as well as the events of 9-11. The theme of the album, overall, is love, where it goes right and where it goes wrong. On the album's closing track, "Help Me See," McLay laments: "It's been foggy, it's been thick, real shady and slick . . . / I've been misused, blackened my heart, barbecue." Jaded-sounding keyboards vibrate, female backing vocals echo and concur and lead guitar round out what are essentially late-night acoustic guitar songs composed when it's quiet—and dark—enough to face oneself with complete honesty. McLay performs on July 26 at Studio E.
Drummer Dan Ransford and bassist Eric Straus provide a solid foundation from which to anchor songs about turbulence and storms. The album was recorded at Banquet Studios in Sebastopol, and McLay is known as an energetic live performer who once rocked himself right offstage onto the hard floor. "The Dustdevils have been doing this for 14 years," McLay reports, "and I'm impressed how live music [in the North Bay] perseveres. Places close, but new places open and people keep trying to have live music in their clubs or houses—wherever they can cobble something together." McLay hails from a farm in eastern Oregon, and his music reflects a rural sensibility, though "everything changed the day I went to a used record store in Boise, Idaho," he says, "and came home with Rocket to Russia by the Ramones." Though his music sounds little like the abrasive punk of the 1970s, there is an honesty and melancholy that still rings true, tinged with hopefulness for something better to come—if even only on a local, interpersonal level, where it indeed may matter most. 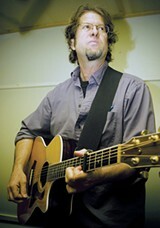 Mark McLay and the Dustdevils perform Saturday, July 26, at Studio E in rural Sebastopol. Directions provided with ticket reservation. 8pm. $20. See www.northbaylive.com for details. 707.542.7143.